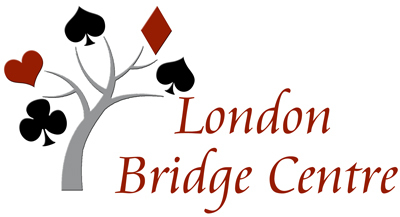 The London Bridge Centre game schedule is structured to accomodate all levels of bridge players. Bridge sessions range from Bridge Lab, 0 to 100 masterpoints, Limited Point Games and Open Games. Bridge Lab: Open to all players, but designed for newer players who want more practice. A director is available to help with bidding and play issues. The session starts with a short lesson on specific topics. No masterpoints are awarded and there is no pressure to get that extra trick. It's a great way for players to build a new partnership. Practice and Play: These sessions are designed for students and beginning players to practice their newly acquired skills. There is a teacher available to answer your questions on bidding and/or play of the hand. Hands are pre-dealt. There is no scoring. Fee for each session is $5 for members and those currently enrolled in bridge lessons; $7 for all others. 0 to 50: Open to pairs where both players have fewer than 50 masterpoints. Sessions may include a short lesson. This is a relaxed game where the director is focused on helping players learn the fundamentals of duplicate play. Limited Point Games: Open to players with fewer than the listed number of masterpoints (300, 500, 750 or 1500). Results are stratified and masterpoints are awarded by strata. Open: Open to all players. Results are stratified and masterpoints are awarded by strata. Fees for each regular session are $7 for members and $9 for non-members. Prepaid Game vouchers are available at 6 for $40 and 15 for $100.